Aunt Lisbef (as C calls her) came over and my sweet Mom made all these little tea party snacks and we got out my old tea set, C made us wear tutu's and we had "tea" for 3 hours it was so much fun. I made Elizabeth laugh for the first time today and it was seriously THE CUTEST thing ever in life. I wish I had gotten it on video but after her nap she wouldn't laugh again for me. Also it is cold as balls here in MI so I got out the baby uggs. E is getting to my favorite age 4 months-18 months is the sweet spot before they turn into little crazies with attitude (at least in my experience ha). 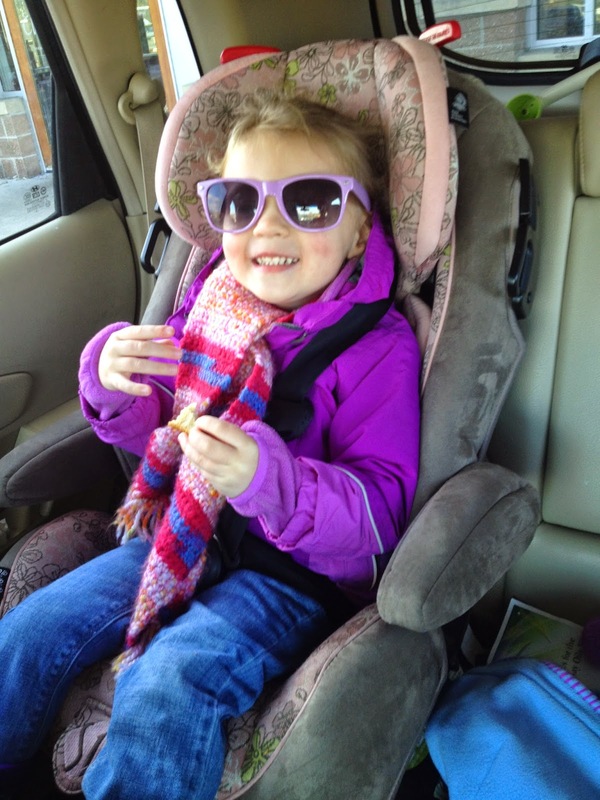 I have two pairs of sunnies in my car, both are mine and C always wants to wear my purple ones. I think they look so cute on her so I always let her. We were going to get coffee because I ran out one morning...and honestly not having coffee on a FREEZING cold day just makes me super grumpy so we had to get out of the house. I love this girl. My car on the other hand is SO messy. It is getting disgusting. In other news I hate Wednesday's. Russ works late and so I have the girls all by myself and it is so tiring to put them both to bed and give them baths with just me. I do it, I don't know how but every Wednesday I just collapse into bed after the bed time craziness and want chocolate ice cream and wine. Lots of wine. oh the baby uggs! so cute! and what a fun tea party!